Our second new game this month as part of the Asmodee Board Game Club is Codenames Pictures from Czech Games. This game is similar to the original Codenames but uses picture cards instead of words. Teams of 4 are split in to two teams of 2 with each team selecting their spymaster, the other 2 players are field operatives. The spymasters know the agent in each location. 20 picture cards are randomly chosen and laid out in a 5 x 4 grid, these are locations where the field operatives can meet agents. Every game uses 1 key card, this is placed on the stand between them. The field operatives must not see this key card. The lights on the side of the key card indicate which team starts. The starting team will have 8 pictures to guess and the other team will have 7. To give a ‘one word’ clue regarding the picture cards and a number (how many of the cards can this word be associated with). Both teams must race to contact all their agents. The game is quite complex and would take so much explaining as it can be played in numerous ways. You can even play Codenames Pictures as a 2 or 3 player game. Whilst I quite enjoyed playing this game, Gee could not grasp the instructions (partly because it was difficult to explain to someone with communication difficulties). This would make a great party game for people over the age of 10 years and is suitable for 2 players and above. I imagine the more players there are the more fun this game will be. 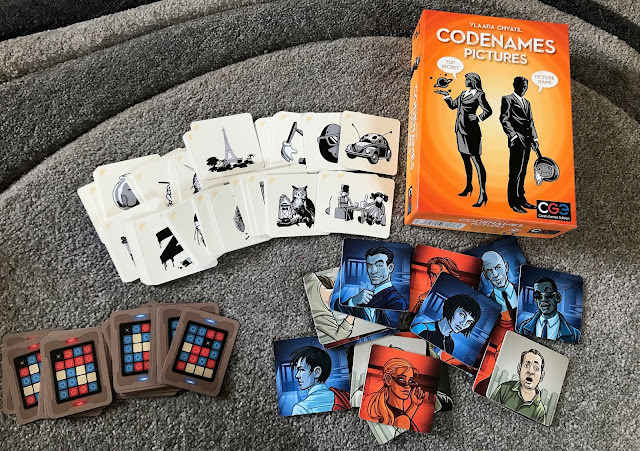 If you are interested in playing Codename Pictures it retails from around £14.98 at Amazon. We were sent this game free of charge for the purpose of this post but the opinion is entirely our own.